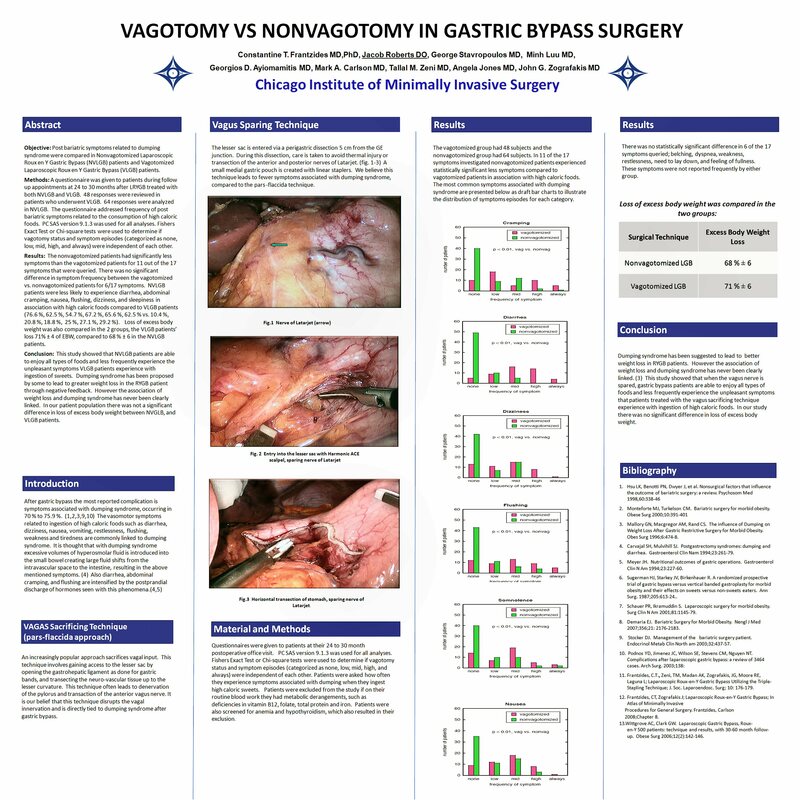 Objective: Post bariatric symptoms related to dumping syndrome were compared in Nonvagotomized Laparoscopic Roux en Y Gastric Bypass (NVLGB) patients and Vagotomized Laparoscopic Roux en Y Gastric Bypass (VLGB) patients. Methods: A questionnaire was given to patients during follow up appointments at 24 to 30 months after LRYGB treated with both NVLGB and VLGB. 48 responses were reviewed in patients who underwent VLGB. 64 responses were analyzed in NVLGB. The questionnaire addressed frequency of post bariatric symptoms related to the consumption of high caloric foods. PC SAS version 9.1.3 was used for all analyses. Fishers Exact Test or Chi-square tests were used to determine if vagotomy status and symptom episodes (categorized as none, low, mid, high, and always) were independent of each other. Results: The nonvagotomized patients had significantly less symptoms than the vagotomized patients for 11 out of the 17 symptoms that were queried. There was no significant difference in symptom frequency between the vagotomized vs. nonvagotomized patients for 6/17 symptoms. NVLGB patients were less likely to experience diarrhea, abdominal cramping, nausea, flushing, dizziness, and sleepiness in association with high caloric foods compared to VLGB patients (76.6 %, 62.5 %, 54.7 %, 67.2 %, 65.6 %, 62.5 % vs. 10.4 %, 20.8 %, 18.8 %, 25 %, 27.1 %, 29.2 %). Loss of excess body weight was also compared in the 2 groups, the VLGB patients’ loss 71% ± 4 of EBW, compared to 68 % ± 6 in the NVLGB patients. Conclusion: This study showed that NVLGB patients are able to enjoy all types of foods and less frequently experience the unpleasant symptoms VLGB patients experience with ingestion of sweets. Dumping syndrome has been proposed by some to lead to greater weight loss in RYGB patient through negative feedback. However the association of weight loss and dumping syndrome has never been clearly linked. In our patient population there was not a significant difference in loss of excess body weight between NVGLB, and VLGB patients.